If you’ve done the exercises in previous sections, you have a notebook full of undigested data and brainstorming results for each card. Now it’s time to refine your data into a coherent and distinct meaning for each card. First, pare down your data. If the same words or concepts are repeated several times, this is probably an important concept to attach to the card. Some keywords will seem irrelevant or peripheral and can be crossed out. If you have the same concept for more than one card, put the cards side-by-side and ask yourself which card illustrates the concept best. Try to have minimal overlap in meanings. You want each card to be very distinct. Write a paragraph for each card. In one or two sentences give a description of the card meaning that’s as neutral and value free as possible. Extend the range of this core meaning to the most positive and negative possible meanings. Justify your card meaning based on the cards imagery. 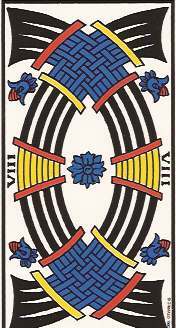 The Eight of Swords is about thick walls, large buildings, institutions, and what is confined within them. At its worst you’re confined in a dungeon, oppressed by tyranny, or trapped with no way out. At its best you are involved with a large bureaucracy, the military, or a complex situation that gives you little breathing room, but you still have some options. This is because the curved swords form the thickest walls in this suit and the flower enclosed by the swords is the smallest and most constricted of any vegetation in the suit. On the next page you’ll learn to read cards in combinations.